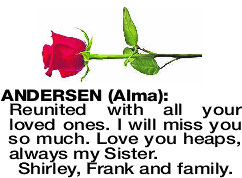 The Funeral Service for Alma Andersen of Madora Bay formerly of Queens Park, will be held on FRIDAY (05.04.2019) at LAKES LAWN Cemetery, 115 Stock Rd, Parklands commencing at 1pm. Passed away peacefully on 28.3.2019. Loving Mother of Gail, and Mother-in-law of David. Grandmother of Craig, Winko and Ian. 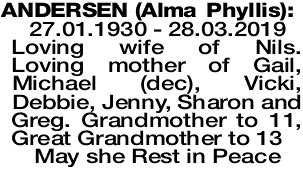 Great Grandmother of Eloise and Sophia. 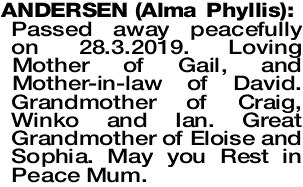 May you Rest in Peace Mum. Reunited with all your loved ones. I will miss you so much. Love you heaps, always my Sister. Memories from our teens to our eighties are all I have left. They will stay forever. 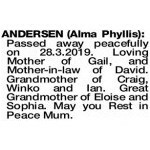 My thoughts are with Nils and family at this sad time. Joy. 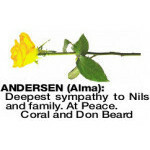 Deepest sympathy to Nils and family. At Peace.